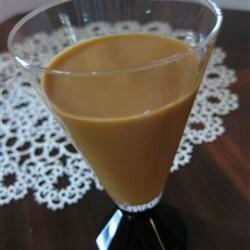 "A smooth, delicious caramel liqueur - great for after dinner sipping, mixed into coffee, or served over the rocks! Put it in a pretty bottle and give as gifts! Liqueur should last for 2-3 months in refrigerator." Remove the labels from the cans of milk. Place the cans into a large saucepan, and cover with a few inches of water. Bring to a boil over high heat, then reduce heat to medium, cover, and simmer for 4 hours. Keep an eye on the water level, and add water as needed to keep at least an inch of water above the cans. After the cans have boiled for 4 hours, remove from the boiling water and set aside to cool for 35 minutes. Open the cans and scrape the browned milk into a bowl, whisk in the spiced rum until smooth, then pour into a bottle with a top. The liqueur will keep for several months in the refrigerator. Lovely taste and smell. Easy to make too, just takes time. We'll see how it keeps but for now it's lovely. This tasted amazing, and was so easy. The only change I will make in the future is adding a bit more rum. It was very thick and hard to pour, or sip, at room temp. Decadent! Very sweet and thick, but sinfully good. I'm betting this would be good drizzled over ice cream or pound cake.